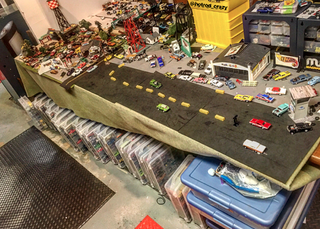 Some of you may recognize me from Instagram as @hotrod_crazy or for writing helpful diorama “how-to” segments on Mycustomhotwheels.com. But starting today, I am a writer for Live and Let Diecast! I plan to post exclusive diorama photos here, as well as reviews of diecast from 1/64 to 1/24 scale and much more! My photo style varies, but I always take pics with my iPhone 5se. I use editing tools from Instagram, and a few other photo editing apps, to get the dramatic settings I love in my photos. My love for classic American cars is clearly shown in my photos. I plan to get more in depth with my favorites in a later post. So stay tuned. Above, a barn find 32 Ford is waiting for its trip to Bonneville; and below, it is reunited with the salt at the fastest place on earth. Yep. Bonneville. All right, I’ll end now with a few more photos and that’s it for today, I swear. Feel free to ask any questions and I’ll answer them as soon as I can. Thank you so much and I’m looking forward to what the future has in store for me here!